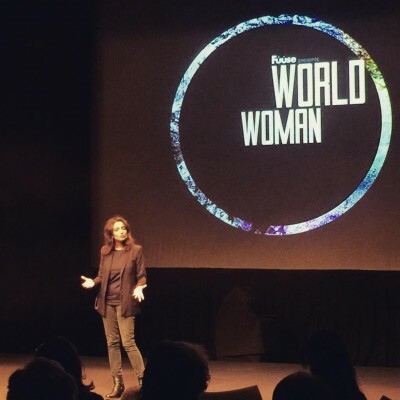 Deeyah Khan, the filmmaker and human rights activist, could bask in the glow of overwhelmingly positive social media feedback after she opened a conference for women of the world in her old hometown of Oslo on Friday. The conference is just one of her current projects – she’s also making a new film about the radicalization of young Muslim men. Deeyah, born Deepika Thathaal in Oslo in 1977, grew up in a musical family and was known as an artist under her Deepika name in the 1990s. She left Norway, however, after receiving threats from fundamentalist Pakistanis who objected to her own musical career. She’s since been based in London for nearly 20 years and went into filmmaking among other artistic ventures and social causes. She won both an Emmy and a Peabody award in 2013 for her documentary film Banaz: A Love Story, about a British honour killing. The conference was billed as “two days of talk and performance” and “an intimate global gathering of solidarity in Oslo.” The theme was freedom of expression, made all the more timely after the terrorist attacks in Paris earlier this month. Comments like “she’s done it again,” and “how inspiring” were common amidst social media reaction to the conference’s opening sessions on Friday. It was to feature a concert Friday evening with artists including Marilyn Mazur and Mari Boine, and continue on Saturday. Deeyah, meanwhile, is finishing work on another film. She told Dagsavisen it will be about the radicalization of young Muslim men in the west. “Why does it happen? Why does radical Islam have steadily greater appeal? These are questions that interest me,” Deeyah said. It’s due to premiere in April.